View Resources for Course Registration and Student Admin Resources page. 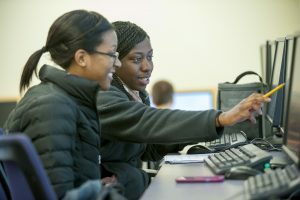 View How to Register PowerPoint and video created by UCONN students. Enroll in classes beginning on your enrollment appointment (“pick time”). This is the date you can start enrolling in classes. You have until the end of add/drop to adjust your schedule. Find out when your enrollment appointment is in Student Admin. You are not required to meet with an advisor prior to registering for classes. However, if you have scheduling concerns/questions, make an appointment with your advisor. Please note that honors students may be required to meet with faculty advisors if the faculty advisor uses advising holds. If your advisor has no available appointments at the time of your enrollment appointment, go ahead and enroll in classes on your own. Make an appointment to see your advisor to discuss any possible adjustments to your schedule before the last day of classes. Appointments are made online using NEXUS. Note that honors students who are assigned to a faculty advisor should email their advisor to ask when their office hours are or to request an appointment. Review your Academic Requirements Report (“Advisement Report”) on Student Admin. Use the Schedule Builder to create schedules. This online tool helps you build multiple schedules to suit your scheduling needs. Use the Dynamic Class Search to search for classes with open seats. This online tool will help you view class availability and show you which class sections have unreserved and reserved seats for specific student populations (such as honors students or majors). Click on “honors courses” to search for honors classes. Students enroll in classes via Student Admin. View the “Student Help” section for more information on how to add/drop/swap classes. If classes are closed, continue to monitor the schedule of classes for a seat to open up. Students can request permission numbers but there is no guarantee that a student will be able to get a permission number. Advisors don’t have permission numbers but contact your advisor if you need help with enrolling in an alternative course. Some classes also have a “waitlist” option. Click here for more information about waitlists. Advisors generally don’t have permission numbers but contact your advisor if you need help with enrolling in an alternative course.